At the start of each school year, Bullis students and staff come together for an assembly to renew their pledge to support the Bullis Honor Code. In the assembly, student speakers from each division—Lower School, Middle School and Upper School—present their view of the importance of the honor code and what it means to them. A representative from the staff also speaks to talk about the importance of the honor code and how it guides and enhances daily life at Bullis. 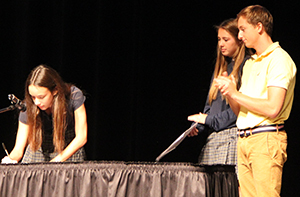 All students sign the Honor Code in advisories or classes during the week after the assembly, and Bullis tradition calls for that process to begin with representatives from each grade stepping forward in the assembly to sign. 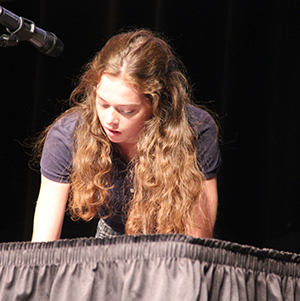 We, members of the Bullis community, actively value integrity, courtesy, trust and creativity. We believe that pride in our diverse community is built upon sound attitudes, judgments and behaviors. We, therefore, will conduct ourselves respectfully and responsibly at all times. We will abide by the philosophies, principles and policies of the Bullis School and will conduct our daily activities in the true spirit of caring and community. This Bullis Honor Code is a statement of commitment by the Bullis community to itself. I will embrace truth and honesty in word and deed. I will respect the rights, backgrounds and views of others. I will be accountable for my actions at all times.